Hello there! If you're new here, you might want to subscribe to the RSS feed for updates Midwest Family Travel! The cabins were great for our setup. We all met at Cabin One and made breakfast together. We cooked up a nice meal and enjoyed planning out and discussing what we would find today at the quartz mine. Cabin one had a large table and we almost all fit around it! 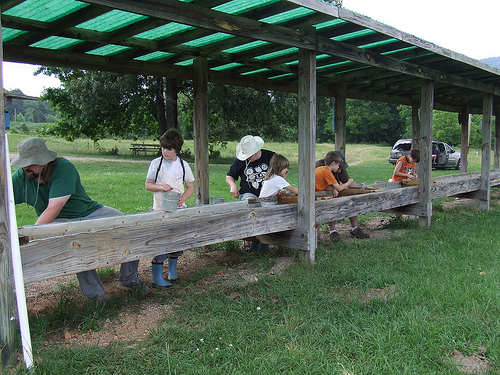 The kids wanted to eat back outside at the picnic table, so it worked out well. We cleaned up and headed out. This cabin was a little further than our original plan from the Diamond Mine, but we could bring along the dog. It was closer to the quartz mine though, so all in all, it worked out well. That meant that today, we didn’t have far to go for our next round of treasure seeking. 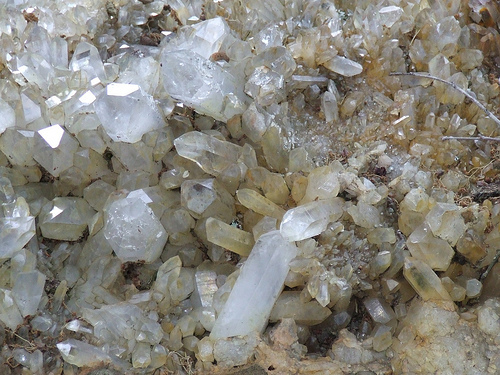 We chose well in Wegner’s Quartz Mine. The people who checked you in were so friendly and helpful, it was great. I am not a rock hound by any means, so I need someone to show me what I am looking for, and how to find it. They were great for me. The kids have been studying minerals and rocks in school, so they already knew some of this; however, they have never found them on their own out of the mine. It is a bit different than studying a sample in school which is already cleaned and polished. The instruction was great. No one at the mine made us feel inferior for asking novice questions. In fact, they took us under their wing and gave us some extra tips on how to be successful. This was great, since the kids soaked up the advice and moved all over the field looking for new “hot spots” for the best finds. This mine was wonderful, in that they gave you buckets and garden shovels to use. We had brought our own, having read up on mining and having friends who are rock hounds guiding us in the gear we should take. We felt pretty well prepared. The mine is really a field of red clay that has been dug to the surface from the underground mine. This is surface mining, and you work your way around the field. Each person found their spot, and began digging away! Immediately you could hear excited cries of "look at this piece!" and "I found a great one over here! "; "This one is so pretty!" This continued for hours, as we all filled our buckets with prime samples of quartz. One child proclaimed they had more than they could ever use, so they might sell some of theirs! The great thing about the mine is that you only pay an entrance fee and whatever you find you take home. There is no additional charge, one piece or one bucket full. It’s up to you and the space you have in your car! We went for buckets of course! The mine had some picnic tables set up in the shade, so we took a break and had a picnic lunch. Next, we moved over to the gemstone sluice. Now, these aren’t gemstones native to Arkansas, so if you're a purist type of rock hound this won’t appeal to you. But the experience was worthwhile for the kids. Where else can you sit with your bucket of dirt, pour it into a screen and run it through a sluice and work hard to identify all the gemstones you uncover? We had a great time and everyone took home a big bag of gemstones. We spent around 4 hours at the mine, and it passed by pretty quickly. 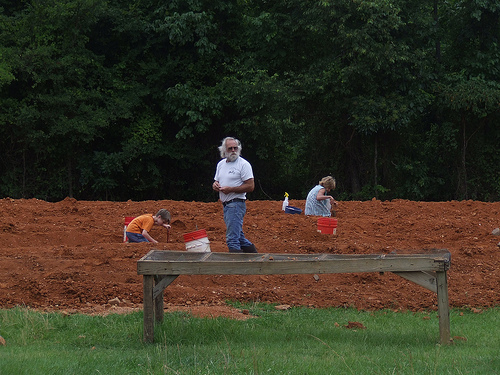 Of course, we had kids who love to dig in the dirt, and the excitement of finding lots of treasure. We were hot and sweaty at this point from sitting out in an open field with near 100 degree temps and what felt like 100% humidity, so we decided to go into town for ice cream. There was a great little ice cream shack, the Dairyette, just up the road, and it hit the spot perfectly. We sat outside with our dripping ice cream and tried to eat it before it melted. It tasted pretty good after a hot day at the mine. For more photos from our Arkansas Diamond Mining adventure, check out the gallery.